specialist recommended FLAT ROOFERS NEWCASTLE UPON TYNE - newcastle flat roofing. Another customer delighted with their new Rubber Roof in Killlingworth, Newcastle Upon Tyne. Thanks for your enquiry. We will respond within 24hrs. New Garage Flat Roof Replacement Ponteland, Newcastle Upon Tyne. fIRESTONE EPDM RUBBER FLAT ROOFING NEWCASTLE UPON TYNE - Longer Lasting Flat Roof specialists. Leaking flat roofs have long been a problem for homeowners as a result of the inherent weaknesses of traditional Mineral Felt Bitumen Flat Roofing Systems. Leaking felt roofs and felt roof repairs have been something we just accepted as part of owning a property with a flat roof on the garage for example. GOOD NEWS! : Flat Roofing Systems and the Flat Roof Solutions that are now available can and will solve your flat roof problems for good. Firestone RubberCover EPDM Rubber Roofs have a proven lifespan of up to 50 years and as such all our rubber roofing membranes come with a 20yr manufacturer warranty. 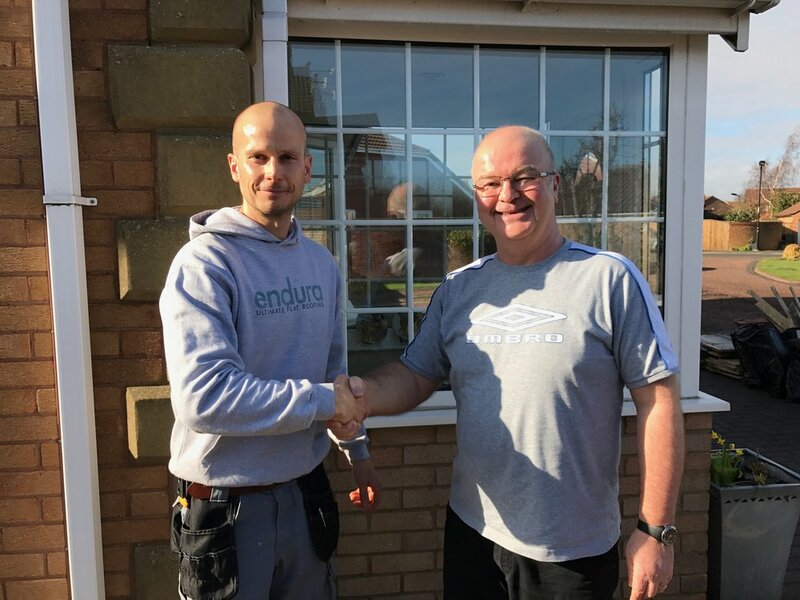 We back that up with our own Insurance Backed Installation Warranty for every flat roof installed by Endura Flat Roofing Ltd.
NO MORE LEAKING FELT FLAT ROOFS - GUARANTEED! — Independent Study - performed by TeConA GmbH, Wurzburg. EPDM Bay Window Flat Roof in Gosforth, Newcastle Upon Tyne. REPLACEMENT FELT GARAGE ROOFS NEWCASTLE UPON TYNE - felt roof replacement newcastle. All felt roofs will fail as a result of the nature of the flat roofing system. The harsh weather conditions we know and love in Newcastle and the North East wash away the green mineral from the surface of the felt roof membrane. This leaves the Bitumen underneath exposed to the UV rays from the sun which damages it causing it to crack and ultimately leak. Fortunately, our EPDM rubber flat roof membranes are extremely resistant to UV rays and therefore do not deteriorate in the way felt roofs do. The Firestone RubberCover Rubber System we specialise in is a man made rather than natural rubber allowing the formula to be specifically developed over the years for maximum resistance to UV and other weather elements. The exact composition of rubber roofing membranes has been tweaked and developed over 30 + years giving us the incredibly long lasting flat roofs we are able to install today. So no matter what the weather in Newcastle and the North East can throw at us a rubber roof from Endura Flat Roofing Ltd can withstand it all for a very long time. Guaranteed for 20 years and a proven lifespan of around 50 years! Leaking GRP fibreglass roof replaced with a Endura’s Guaranteed Rubber Roofing in Bedlington, Newcastle Upon Tyne. — Dr Gracia Moss - Garage Roof in Gosforth, Newcastle Upon Tyne.